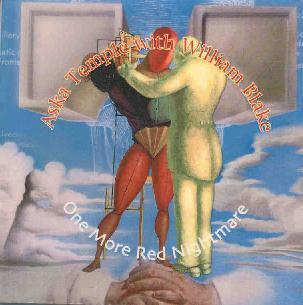 Aska Temple with William Blake - "One More Red Nightmare"
Aska Temple with William Blake - One More Red Nightmare"
On his last studio album, St. Maria, She Extends Her Hands, John Übel, aka Aska Temple, collaborated with jazz drummer Yuusuke Mukae. Übel’s classical and electronic styles uniquely blended with Mukae’s superb free-jazz drumming style, and the result was so successful that they decided to take the experiment one step further. Adding Kyouichi Tokuyama on guitar to complete the trio, the group headed out to the Kobe jazz livehouse Big Apple where their amazing performance was captured live for this recording. The tone is set with the opening track, the epic Blue Flower, a swirling excursion of jazz, electronic, and classical music styles. Rather than going totally freeform, Mukae’s drumming holds things together here, exploratory, yet allowing light rhythms to emerge while Ubel’s piano and Kyouichi’s guitar weave around them. The electronics are featherlike, lending small touches, mostly near the beginning, but just enough to add a nice bit of spaciness to the proceedings. One More Red Nightmare doesn’t seem to have anything to do with the King Crimson piece of the same name, but it is darker and heavier than the previous piece, with Kyouichi’s guitar especially taking on an angular, edgy, Frippy sound to it while Übel pounds away on the piano, conjuring up a haze of clashing harmonics and dissonant cadences. Mukae’s drumming is again outstanding, giving cohesion to the chaos without following any rhythmic structure too closely. Together, the three of them find just the right balance. The luminous Moon Voyage Part 3 brings the synthesizer a little more into the front of the mix, as Mukae’s drums get more exploratory, especially towards the end of the piece, sounding like meteorites and space fragments reverberating off the hull of a space ship. The band covers the title track from Hosanna, one of Aska Temple’s studio albums, next. By shortening the piece, and adding in Mukae’s drumming, and some freaky, psychedelic guitar work by Kyouichi, Übel fixes the problems with the original, maintaining its wonderful uplifting feel but without it ever dragging, as he manages to play complex synthesizer and piano lines at the same time! The last track, Purple Rose, is a shorter, free form freakout, starting with an explosion of synth, before diving headlong into a miasmic haze of piano, drums, and guitar. But towards the end, the band spirals off into a bit more of a spacey symphonic realm, with Übel’s synths painting broad washes of sound beneath, creating some lovely textures. All in all, this is one of the finest Aska Temple albums I’ve heard so far, but it is a bit of a departure from the more electronic, Krautrock journeys of his previous works. I think it definitely requires an appreciation for spacey, spiritual, and exploratory jazz like Sun Ra, Alice Coltrane, and Pharoah Sanders. But as the title suggests, fans of some of the jazzier King Crimson stuff may find much to enjoy here too. Email Jöhn Übel at: johnubel@mac.com.